It was so refreshing to be reminded that there’s more to Iraq, Syria and Yemen than fighting and suicide bombers. Last Saturday, at North York’s Central Library, the talk was about the food from the area. Did you know that the first known recipe was found in Iraq in a Babylonian temple dating from 1750 B.C.? Do you know of any other civilization with written recipes older than that? Later, a stele with 36 lines recorded the ingredients of a banquet hosted by an Assyrian king in 879 B.C. For 69,574 guests, it included 1.400 sheep, 500 cranes, 10,000 containers of beer, and 10,000 goatskins of wine. Ancient cultures like the Nabateans (who built Jordan’s Petra), the Babylonians, and the Samarians contributed to Arab cuisine, said speaker Habeeb Salloum, but it was the Silk Road from China that influenced it most, long before Marco Polo. So fusion cuisine is not a new thing. 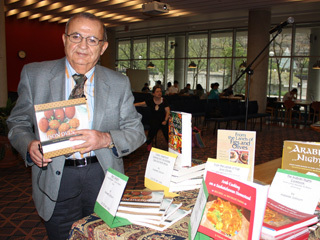 Habeeb Salloum is the author of several cookbooks on West Asian or Middle Eastern cuisine. One of his books is exclusively about cooking with bison, yes bison. How more Canadian can you get? He has also published Arab Cooking on a Saskatchewan Homestead. Also on the program was the Persian-Canadian Dance Trio with Araz Salek’s amazing hands playing the Tar, a long-necked lute from Persia. Of course, this being a Canadian performance, he was accompanied by Andrew Timar on a flute, drum and a string instrument called the kacapi from Indonesia. This was an amazing multicultural performance, especially when a dancer joined them on stage. The museum was having its Iranian Heritage Day at about the same time. I got there at the end of the performances as an audience of over 1000 people applauded a historical fashion show with cheers. The organizers said they had printed 1000 brochures and they were all distributed. 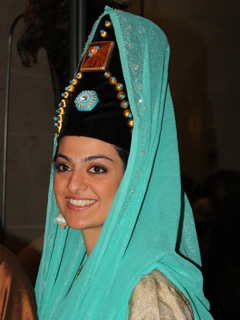 I managed to take some images of the costumes especially that of Sara Nejad who was wearing a tall, cylindrical hat similar to one I saw in a museum in Kazahstan. It was a style worn in the Parthian Empire that existed from 247 B.C. to 220 A.D., she said. How fortunate that Toronto is home to such talent and living history. As for the term Middle East, you probably know it’s a British colonial term. The politically-correct name is West Asia. West Asia? Now that’s a term I’ve not heard before. And so you’d say Far East is also no longer PC, am I right? That too had never occurred to me, although of course I did realize that it was a Euro-centric term. Another interesting post, Ruth… and you had a busy and fun Saturday! Sharq ul-Awsat? I guess it could be a “Eurocentric” term but, gosh, it’s pretty common! Hi Serge, Many thanks for your comments re Sharq ul-Awsat. If you have any other thoughts on how to improve this Blog, please let me know. Do you know of any upcoming events in your community that would interest other Torontonians? Ruth.